Motherhood is messy. Even though your little angels are as cute as can be, they sure can make a mess. That is why for many new moms, fashion and style go out of the window, at least for the first few months. You’re going to want to be comfortable and prepared for any mess, whether it’s in the form of a dirty diaper or a burp that has gone wrong. But, it’s not all rough and tough forever. You can start being fashionable again, and remain ready for action, with the baby-rearing tools that are made just for the stylish mom. And arguably one of the most important tools of all is the diaper bag, your go-to kit for fresh nappies, snacks, and clothes. 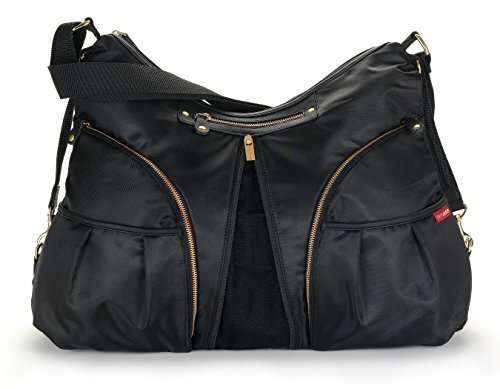 Read ahead for our diaper bag recommendations for the stylish moms who want to stay ready while also staying stylish. 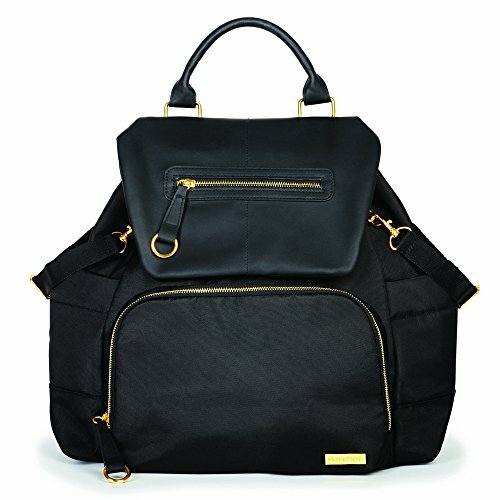 Diaper Bag Recommendations for The Stylish Mom: But first, what do you need to look for? 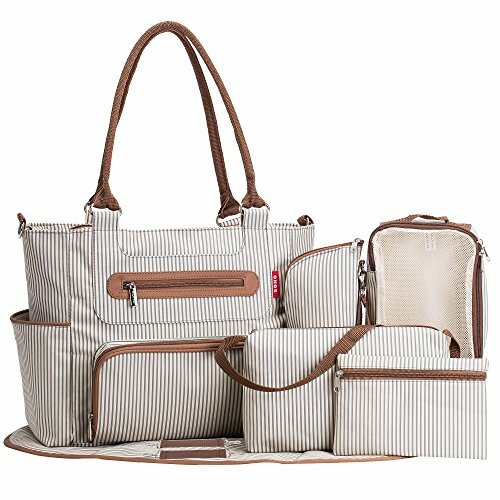 Looking through countless lists of diaper bag recommendations online can get pretty overwhelming, especially when you don’t know what you’re looking for. A lot of bags seem very similar, yet prices vary. That’s because all bags have their own unique set of features and they’re constructed for different purposes. Storage is the number one feature to look out for. You need a bag that can hold everything you need, from the diapers to the miscellaneous items like thermometers and bottles. Most bags come with dividers and pockets. Opt for these types, as they help you stay organized at all times. Some bags even have insulated pockets that are useful for keeping milk bottles warm. This is something that is often overlooked. The size of your bag’s opening and the ease of getting it open are both very important factors. When you’re juggling a crying baby and a grocery cart with no one to help you out, you’ll enjoy a bag wherein contents are easy to access in a rush. The weight of the bag can affect your shoulders, back, and arms, especially if you carry it for extended periods of time. Make sure to choose a bag that is made of lightweight but durable material. Some fabrics are easier to clean than others. Tons of diapers come in water-resistant and easy-to-wipe fabrics, which is perfect for maintaining a bag that is dust- and dirt-free. Also, make sure your bag is machine washable. Once you’ve figured out what to look for in a good bag, it’s time to dive deep and find the bag for you. To make things easier, check out our very own recommendations below. These bags score in both utility and style. This bag screams trendy. It’s got the function of a messenger bag with the form of a chic satchel. The long strap keeps your arms free and makes it easy to lay it down on the floor, while the metal feet underneath the bag keep the underside and the changing pads clean. This bag has 12 pockets. Yes, 12 whole pockets to store and organize basically everything in your arsenal. Different to the Skip Hop Chelsea in style, but similar in its panache, this one is a tote with a preppy pattern and neutral color palette that makes it look just like a handbag. With it being a tote, it has a wide opening, meaning you’ve got easy access to all your needs. It also has a detachable shoulder strap so you can wear it satchel-style. It’s also equipped with a changing pad and insulated bottle pockets. Arguably the most purse-like in appearance on this list, this bag isn’t just stylish, it’s also unique in that it expands to give you extra space! Opening up a zipper lets this bag expand up to 20%. With 11 pockets all over this thing, it’s not hard to tell why this is a popular one. 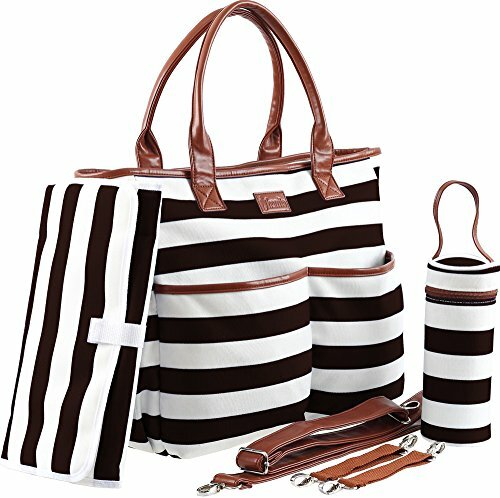 The striped pattern and cream color make this bag easy on the eyes and a great match for almost any outfit. 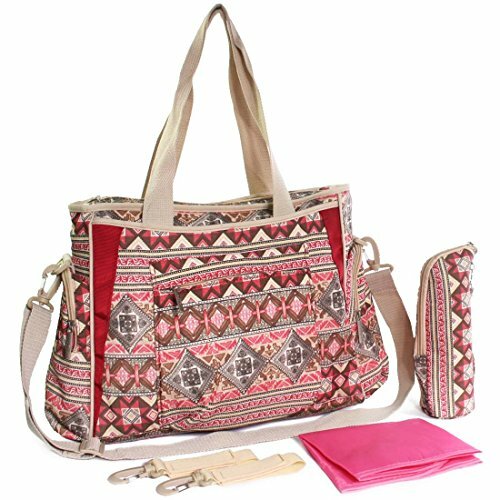 Style aside, this bag is wonderful for moms who love accessories, as it comes as a seven-piece set. The bag has a changing pad, two accessory bags of differing size, a bottle bag with insulation, and even stroller attachments, among other things. 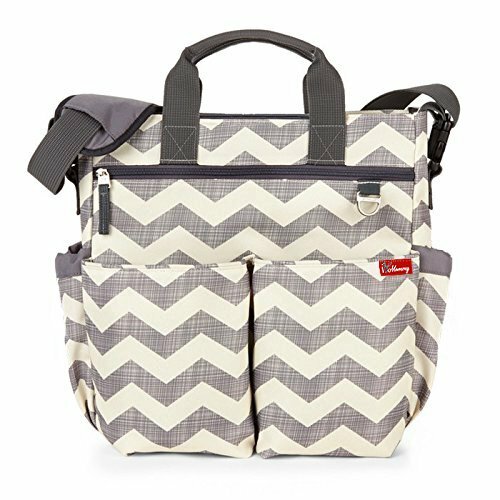 Another one of our favorite diaper bag recommendations, this bag is great for moms who have a more laid back, almost hippie-leaning sense of style. The print is fun and colorful for festive days, and the straps are convertible from shoulder strap to crossbody style. An insulated pocket for holding bottles is a present in this bag, as is a changing pad. It’s got all the essentials packed into a fun and lively package. In contrast to the other bags here with a multitude of pockets, this particular bag only has six. This can be seen as a blessing — it’s minimalist. It keeps you from fumbling through all 12 pockets before finding what you need, and it’s compact and lightweight compared to other bags out there. On top of that, it’s got a great casual style that makes it a great everyday bag. For new moms, you only want to carry around the good kind of baggage. The kind that keeps your hands free, your shoulders free of aches and pains, and your head clear of worry and stress. Being a mom is already a challenging job, so be like a superhero and be ready for action with your own version of a utility belt. On top of being ready, maintain that feel-good level down to the aesthetics with a bag that isn’t just functional but also looks good. After all, looking good makes you feel great. Stay on point, Momma!